Mamfe — "The value of human life is diminishing and the human person is wasted away for any flimsy reason or even for sport. This has to stop and we call on all those involved in killing innocent civilians to refrain from these inhuman and monstrous acts," bishop Andrew Nkea of Mamfe has said. The bishop expressed his sentiments in a statement sent out on November 23 following the killing of Fr. Cosmas Omboto Ondari, a Kenyan Mill Hill Missionary, working at St. Martin of Tours, Parish, Kembong. According to eye witness accounts Fr Cosmas was shot and killed on Wednesday November 21 by Government Soldiers (Gendarmarie Nationale), who were shooting at random from their passing vehicle. A certain Mr. Johnson Ndip Nchot was also shot in front of his house, a few meters from the Church building. "I visited Kembong Parish on Thursday November 22, 2018, and I personally counted 21 Bullet holes made on the Church building of Kembong... The blood of the murdered priest was still clearly seen on the cemented entrance to the Church just at the door. He died right in the house of God and it is our prayer that the God whom he served so well will welcome him into his eternal kingdom," Bishop Nkea noted. 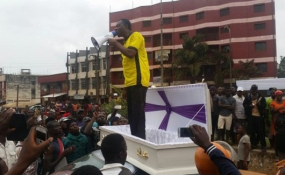 "It is our fervent hope that these killings should stop in our diocese and in the Anglophone Regions of Cameroon," the bishop added. "I call on the powers that be to carry out a thorough investigation into this heinous crime committed against an innocent and peace loving missionary and bring the culprits to face justice. This is the only way those who have been hurt can truly be comforted, and peace can return to our land," he urged.